Emily Freeman starts her book by talking about how people usually only talk about after they have made it through a trial. We tend to focus on the end, when an answer has been given, or the illness goes away. Very rarely does anyone offer help or advice while we are still stuck in the middle, when we are still struggling, and it doesn't seem like there is ever going to be an end. 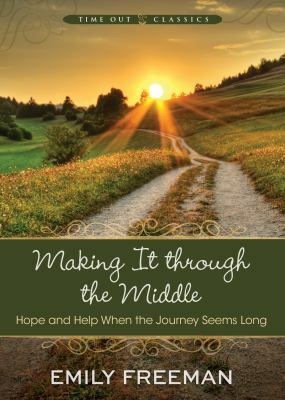 She uses her personal experiences and scriptures to share six lessons that can help us make it through the middle moments in our lives. This was the perfect little book. When you feel stuck in the middle of a trial, you usually don't have the ability to sit down and read a big book on all the things you need to be doing. This can easily be read in one sitting and the advice is simple. This was a really inspirational book and exactly what I needed. I really liked this book. It was little, but gave me a lot to reflect on. I will probably end up buying this book because there were several sections I'd like to highlight and spend more time thinking about. This is one I could see myself reading again multiple times!